According to the most recent data, there was a 1.8% growth in giving in 2018. Growth in giving is defined as the net of gains minus losses compared to the previous year, so it should be seen as the most vital benchmark metric when it comes to understanding the financial health of not only the industry but also for individual nonprofits. Yet diving into the numbers further, there was a 2.8% decrease in the growth in the number of donors in 2018. Our industry saw 4.855 million donors disappear, which wiped out any of the gains we saw for new or retained donors. 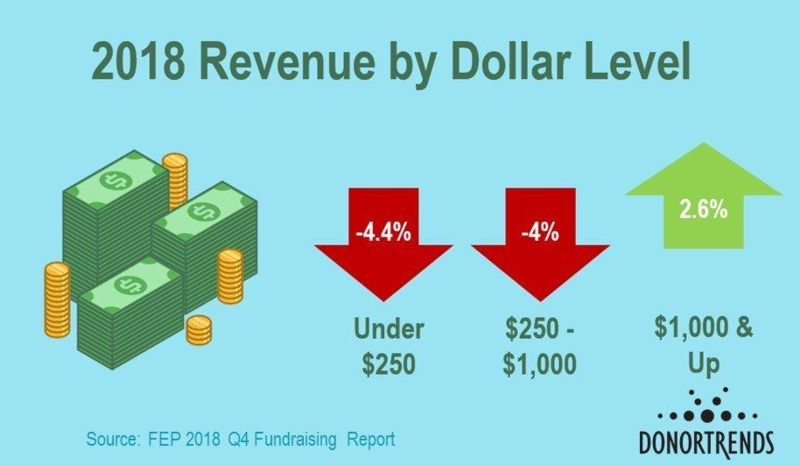 The revenue losses were seen in small dollar donors, with a decrease of 4.4% for donors under $250 and a 4% decrease for donors between $250 to $1000. The only increase was found in donors giving $1000 or more. Our industry should be alarmed at this information and not take comfort that there was a net increase in giving but instead be focusing on how to re-engage donors of all sizes. There are some concrete strategies that we as an industry should be taking. Our organizations need to shift from single year planning to long term, multi-year strategic revenue campaigns. To organize ourselves, we should be concentrating on two key metrics - Growth in Giving Percentage and Donor Lifetime Value. Like businesses, we should shift our attention to analyzing both Gross and Net Revenue and these are the key metrics to help organize ourselves both at the individual level as well as throughout the industry. The reality is that acquisition is always going to be a costly endeavor, costing the average nonprofit $1.25 to obtain $1 from a new donor. If our boards are not prepared to understand the Lifetime Value of a donor, then we will be unable to plan for the future of our operations. Investments into both smart acquisition campaigns as well as a heavy emphasis on retention of donors will ensure that we will see healthy increases in our giving at the organizational and individual donor levels. Acquisition and Retention are excellent metrics to review monthly to gauge the health of your revenue campaigns. If we understand that our acquisitions of new donors will have a higher upfront cost, then we will be able to then shift the conversation on obtaining the highest quality donors for our organizations, not just high volume. High quality donors aren’t necessarily higher revenue but instead donors who have been cultivated to be long term supporters of your organization’s mission. Then shifting your organization’s strategic emphasis toward obtaining the highest retention rate possible should be a high priority. One of the most frustrating things I’ve experienced is seeing nonprofits struggle with the basics around data management for donor stewardship. A big reason for this is that nonprofits are juggling multiple databases that do not talk to each other. We also have seen a proliferation of technology solutions but little focus on integration between platforms in a cohesive and easy way. We need to make a commitment industry wide toward data stewardship and invest the proper resources into ensuring that nonprofits can feel confident in the technology supporting their missions. 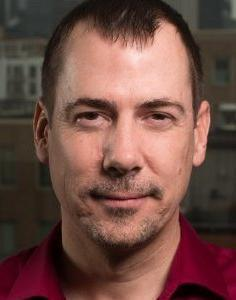 Practical investment into collaboration among software providers is one the best outcomes of the Fundraising Effectiveness Project but we can do more - we would love to welcome more data providers to the initiative as well as deepen our collaborations with researchers, consultants, and other stakeholders in the industry. We also need nonprofits to put resources and prioritization toward their data as well. The most commonly cited reason that a donor no longer wants to support a mission is due to their sense that the nonprofit does not care about them. Little things like getting the donor’s name wrong in an appeal or thank you letter will have a major impact in your ability to manage the relationship and steward that long term value that we see when retention occurs. If we’re serious about creating lasting relationships with donors and growing our giving, we need to invest time, talent, and treasure into ensuring our data and donors are stewarded. Invest more in multi-channel communications, new technologies and social engagement. A continuing theme at the conference was that we need to set the standards of success for our industry. Best practices and guidelines that exist are a starting point, but investing into the education on what it means to be a truly excellent nonprofit is a major task that we need to work toward. The reality is that our industry has the third largest workforce in the entire United States. We generate billions of dollars in revenue and affect people around the world. We have immense power and with that great power comes great responsibility. We must therefore look past the technological and competitive business walls that keep us from working together and begin to create cooperative arrangements like the Fundraising Effectiveness Project that focus on educating board members, employees, and donors on what it means to be the best versions of ourselves. These are major initiatives that need the assistance of everyone that this sector touches. I look forward to being a part of the solution that will change the landscape of philanthropy for decades to come.